element x first at level 0,then level 1 and assume upto level (d-1). While determine at (d-1) level, x may have less or more in comparison to element at (d-1). The we enter x either left or right. In both cases no of determined code will be d. Now Assume we require to search for x, this time again traverses the similar path as we traverse. Whereas inserting the element, we stop at (d-1) the level but for searching we determine node at dth level also i.e. the node having x. 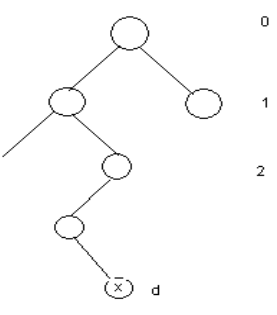 Thus number of node determine while inserting are d while incase of searching it is d+1 i.e. one more than whereas inserting, as the result. How would I use variables of a C++ object within a Lua function, and then call the Lua function from C++ code? how to make basics strong and best logic skills what are the best way to be a expert programmer ? what counts a lot knowledge or practice?